PARK, Y. , KANG, S. , SEO, J. Information extraction is one of the main research tasks in natural language processing and text mining that extracts useful information from unstructured sentences. Information extraction techniques include named entity recognition, relation extraction, and co-reference resolution. Among them, relation extraction refers to a task that extracts semantic relations between entities such as personal and geographic names in documents. This is an important research area, which is used in knowledge base construction and question and answering systems. This study presents relation extraction using a distant supervision learning technique among semi-supervised learning methods, which have been spotlighted in recent years to reduce human manual work and costs required for supervised learning. That is, this study proposes a method that can improve relation extraction by improving a distant supervision learning technique by applying a clustering method to create a learning corpus and semantic analysis for relation extraction that is difficult to identify using existing distant supervision. Through comparison experiments of various semantic similarity comparison methods, similarity calculation methods that are useful to relation extraction using distant supervision are searched, and a large number of accurate relation triples can be extracted using the proposed structural advantages and semantic similarity comparison. M. Craven and J. Kumlien, "Constructing Biological Knowledge Bases by Extracting Information from Text Sources," in Proc. of International Conference on Intelligent System for Molecular Biology, pp. 77-86, 1999. K. Bollacker, C. Evans, P. Paritosh, T. Sturge, J. Taylor, "Freebase: A Collaboratively Created Graph Database for Structuring Human Knowledge," in Proc. of SIGMOD, pp. 1247-1250, 2008. N. Kambhatla, "Combining Lexical, Syntactic, and Semantic Features with Maximum Entropy Models for Extracting Relations," in Proc. of Annual Meeting of the Association for Computational Linguistics, pp. 178-181, 2004. 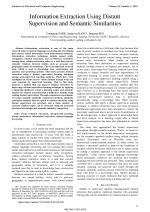 G. Zhou, J. Su, J. Zhang, M. Zhang, "Exploring various knowledge in relation extraction," in Proc. of Annual Meeting of the Association for Computational Linguistics, pp. 427-434, 2005. R. Bunescu, R. Mooney, "A Shortest Path Dependency Kernel for Relation Extraction". in Proc. of HLT/EMNLP, pp. 724-731, 2005. M. Banko, M. Cafarella, S. Soderland, M. Broadhead, O. Etzioni, "Open information extraction from the web," in Proc. of International Joint Conference on Artificial Intelligence, pp. 2670-2676, 2007. 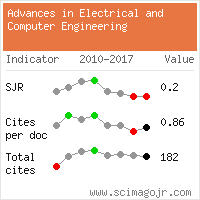 Citations for references updated on 2019-04-22 18:35 in 39 seconds.